The food: It's Modern European/British fare, seasonal sharing plates and several experimental dishes. The standout plates were the crispy squid with a fragrant heritage tomato salad which doesn't sound like it would work, but did, and the perfectly sweet grilled nectarines with a little tang of Princess Alicia cheese and balsamic. The veal tartare with lightly pickled girolles was flavoursome and refreshing - totally on point for a light summer supper. The Parmesan panna cotta didn't quite hit the mark for us - it was too rich and creamy even for two people to finish - but overall, most of the dishes were pitch-perfect and had us eyeing up the next selection from the menu. 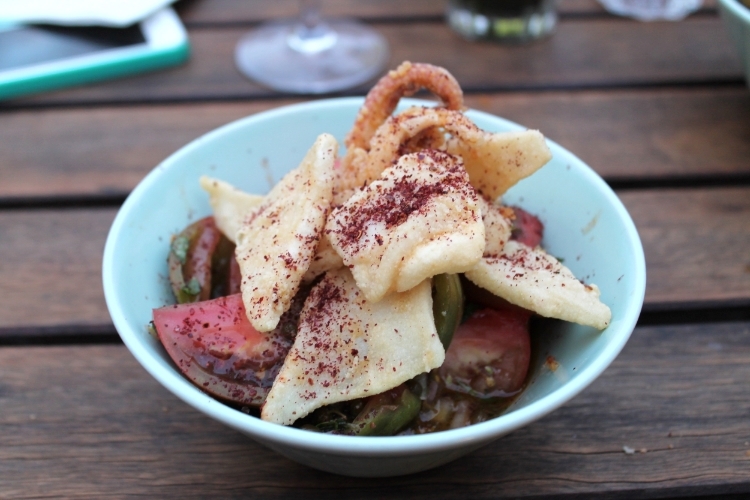 The signature dish: We'll definitely be going back for that squid and heritage tomato salad. When to dine: This would make a great mid-week supper or weekend brunch spot. They're also starting Aperitivo evenings at 6-7pm on Tuesdays to Thursdays where there will be free bar snacks on offer with their stellar cocktail list. Closed on Mondays.